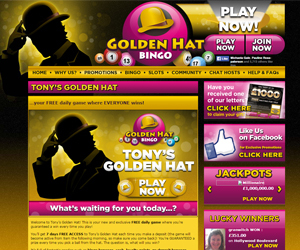 Golden Hat Bingo | Get £25 FREE when you join! 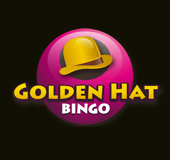 Golden Hat Bingo has a fabulous online bingo community with some of the hippest chat hosts who are always available to help you and give out some encouragement. There are tons of promos at Golden Hat Bingo to choose from. Every time you make a deposit at Golden Hat you'll get 7 days of Free Access to Tony's Golden Ha with gives you a daily free game. You are guaranteed to win a free prize every time that you pick a ball out of the Golden Hat. Prizes range from bingo bonuses, cash and special prizes to personal promotions, re-deposit bonuses and shopping vouchers. Another top promo at Golden Hat Bingo is Supreme Sundays which offers free bingo with fab prizes. If you like chatting to your friends while playing bingo then you must check out their Live Chat feature, we guarantee that you will love it! Also, Don't worry if you can't understand all of the bingo abbreviations, simply head to their helpful Bingo-Lingo page for a great list of all the phrases you'll need to chat all night long! If you don't know what BRB, GLA or WTG mean, then you better go and check out the Bingo Lingo list, it could make all the difference when chatting to your bingo friends. This will also help ease you into the game and definitely make the overall experience more enjoyable and exciting! We all have friends who love bingo, and now is the time to refer them, as Golden Hat Bingo has a Refer a Friend policy and they generously offer players £10 per friend you refer, and give your friend £20 for joining! The more friends that you refer the more cash you can make, the sky is the limit. Plus the added bonus is then you'll also have more people to talk to in the chat rooms! Fun all round. You'll never get bored with the games selection at Golden Hat, there are tons of games to choose from including 90 ball bingo, 80 ball bingo and 75 ball bingo rooms. There are also plenty of free bingo games available. They even have the regular slots machines, Golden Hat Bingo scratch card games and so much more fun stuff! With regular prize draws, bonuses and competitions there's always something happening to grab your attention. That's if you can tear your eyes away from the free bingo rooms!